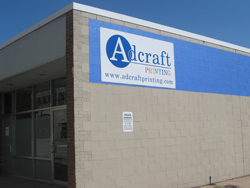 Since 1957 Adcraft Printing has provided the quality of a full-service commercial printer with the convenience and efficiency you deserve. Partnering with you from start to finish, we provide total solutions for all your business communication projects. Our employees are our greatest strength, with over 130 years combined experience and an average of 11 years of employment at Adcraft, they bring expertise and a commitment to outstanding quality to every job that comes through our door. Adcraft Printing has always been a leader when it comes to changes in the way your printing job is completed, investing in the latest digital and offset technologies. Whatever your printing or promotional needs, you know that it will be completed with the latest technology at the most affordable price available.